Last week, I published an article on Smart Maraca that covered the journey of data from a sensor, to the cloud, to a web application. The article received more interest than I was expecting. Sameer Khandekar asked if I can use Azure instead of Amazon Web Services (AWS). My knee-jerk response was — “Sure, Azure has Event Hubs and Stream Analytics, so it wouldn’t be difficult.” For those of you who are new to these, Event Hubs is an Azure web service for ingesting stream data and Stream Analytics is another Azure web service for real-time processing of the stream data. I must admit, it was not as easy as I was hoping. I could not find client libraries for Event Hubs in the Azure SDK for Python, Node.js or Java. I was able to find API support for Event Hubs in the Azure SDK for .NET. However, it felt like an unnatural act to get .NET code running on Intel Edison for a simple task of streaming data to Azure; especially when the Edison was running Yocto — an embedded Linux distribution. Streaming from Intel Edison was also easy. I simply followed the instructions from the user guide. At a high level, it involved three tasks — activating the device, registering a temperature component, and submitting the data. 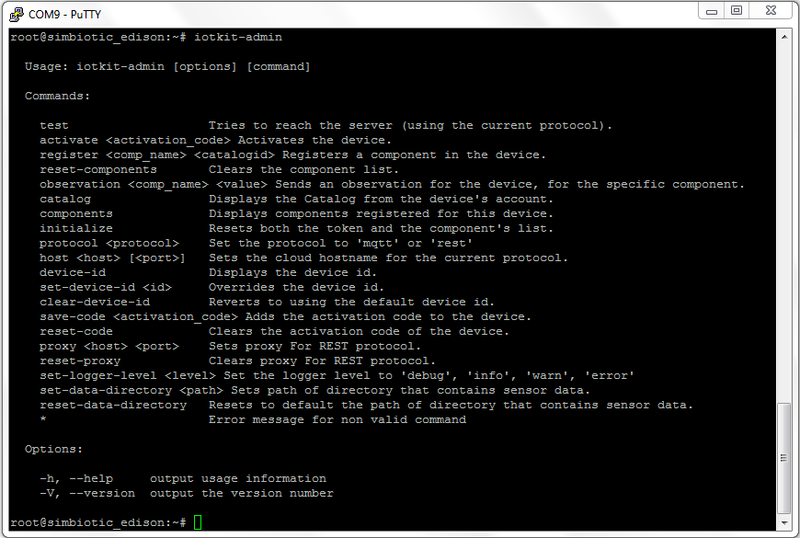 First, I activated my Edison using iotkit-admin activate <activation_code> command. It required an activation code that I got from my IoT Analytics account. The activation process creates a device record in the cloud, associates the device with the account (where the activation code came from), and provides the device with security credentials. 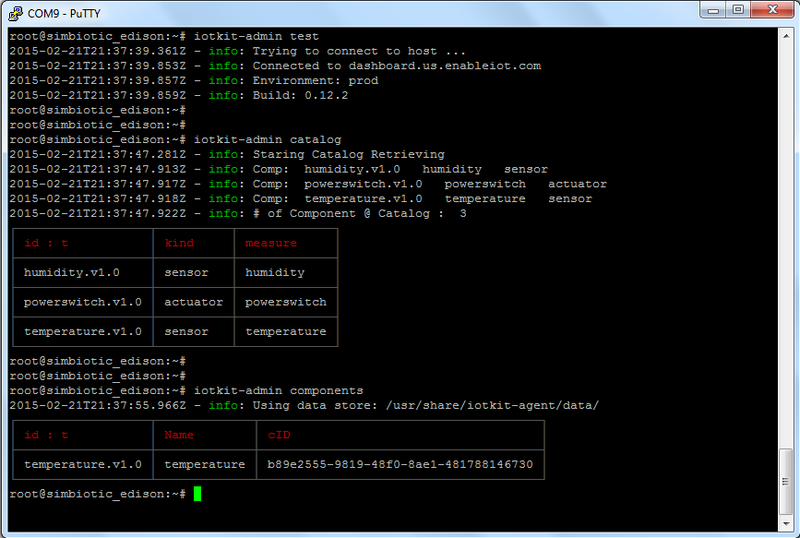 Next, I registered a component with my Edison using iotkit-admin register <comp_name> <catalog_id> command. 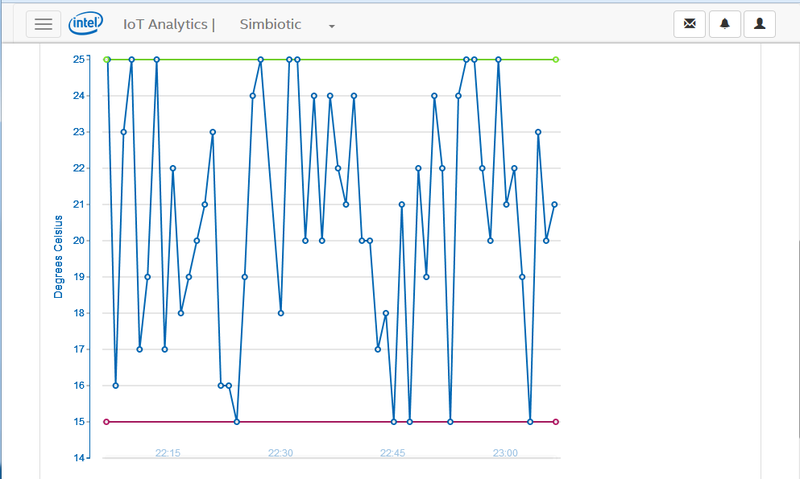 A component is a time series that consists of sensor observations sent from the Edison. So if I want to send temperature data, I would need to register a temperature component. Each component is required to reference a component type within the account catalog. Think of component type as a template for the component — you define the details of the time series once instead of defining it for every device. Each account in IoT Analytics comes with three default component types — humidity, power, and temperature. 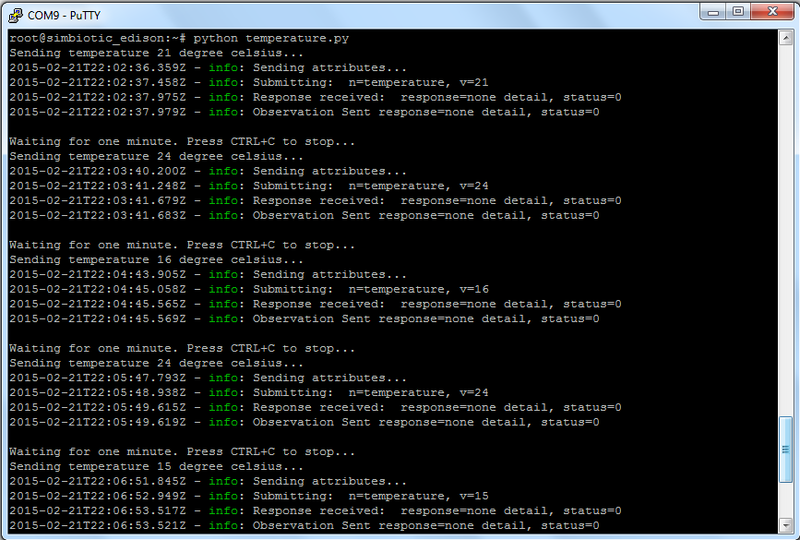 Since I wanted to send temperature data, I registered the temperature component with my Edison using iotkit-admin register temperature temperature.v1.0 command. The following screenshot shows three commands — the test command tests the connectivity of the Edison with the IoT Analytics service, the catalog command lists the components that are available for registration, and the components command list the components that are currently registered with the Edison. As you can see, a component labeled temperature shows up in this list because I had registered that component with my Edison. To begin with, I wanted to figure out how to use Azure instead of AWS for visualizing sensor data coming from Intel Edison, but ended up using Intel IoT Analytics. This was primarily because I could not find Azure SDK support for Intel Edison. Until Azure SDK for Python, Node.js or Java includes support for Event Hubs or until Windows can be run on Intel Edison, AWS or Intel IoT Analytics seem to be the viable options. The thing that I liked about Intel IoT Analytics is that it did not require any additional effort on my part to plot the temperature data on a chart. Imperfect perfectionist. Thinker, Tinkerer, Builder. AWS, Microsoft, Novell. Traveler, Reader, Father. Opinions expressed are my own, not my employer’s.